Subscribe and Listen in to Hoop 4, then participate to enter hoop 3 for networking and to ask and receive Sacred Song Blessings of all our Relatives Hearts. Exchange begins to blossom. Hoop 2 enters warrior training and Hoop 1 is for elders. Hoop 5 is sanctuary and Grandmothers of the Green Grass home! To enter the Hoops, please offer a prayer or blessing for Rainbow Warriors of Prophecy! how to get in contact with and mingle together on social networks. I bless you when you go. I bless you when you arrive. I bless your sacred feet. I bless the sacred sky. I bless the day of dawn. I bless the sacred night. I bless the way you walk, in skips of love you bind. I bless the way you move, in time to heal the wounds. I bless the will of God, that you have been sent home this time! Today I shine, to be a Sun Dance. Today I climb, to shine like a star. Today I am, the morning breaking, come hold my hand, and walk into the light. I am with you, looking inside of your heart. Today, I am free, to friend* (to be relative, to) my enemy. Today, I am, the heart of my reflection. Today, I shine, to be a sun dance. Here I am, Go(ah)dly (spiritual being). Here I bare my soul. Here I give holy walking place to bear (the humble white light unites and shines my light all four directions). And when I harvest, the shining of your disease (release your pain), I will walk with you, to the other shore (blossom like flowers). My heart longs to shine from the inner seas. It's the place I long for, it's clear it is me. I am a Sun Dance. I am the G_ah_d (the voice of heaven's transmission, the wind), I am creation, the star that's born. My heart does break, when you don't sea my face, the darkness valleys of the human race. There shines the light of numinosity glow, the reflection of me, that's where I grow. I am a Sun Dance. I stand to sea. I look at valleys, for all to know. I am the Sun Dance, come hold my hand. We're gonna find the ceremony land. Today I shine, I am a Sun Dance. I shine my heart, inside heaven's roar. My voice speaks loudly to the thunder's knowing. I am the sun dance, watch me glow. Sung by White Buffalo Calf Woman, your Twin Deer Mother, elder crystal person, wakan iyeshka (holy interpreter brings peace) and Sacred Drum by Holiness David Running Eagle Shooting Star, your Father Red Hand, elder lavender person, wakan (holiness), the living fire, the law of love. *befriend means act as a friend, help. Heartbeat does dance to know the wind, to feel the hope of God in STEAD*. We are protected in the wind, when we choose to let the light from within, shine to the above to down below and over the perfect rolling hills. *Stand your ground inside the house of God, of the beloved children who are lambs. There is a place where the Buffalo (flesh of earth, the light that grows, the four sacred directions, where we do) roam, and my heart does know how to roam, to be across the rolling hills, to eat of the green grass and know my fills. I am nourished by this love, the place, where I live inside the dark, the heaven calling, to fill me up. We the Rainbow Clan do know (how to drink from this spiritual cup), that we are part of this sacred show, where the Horse (soul of heaven, the heart that knows) runs wild and free, to be with Warriors, the Dog (rainbow warrior of prophecy who stands their ground) who bleeds (follows the red road, the law of love, where the fighting is for the unification of the broken heart, to bring the warrior up). For the pipe brings me home to the world, that I belong. 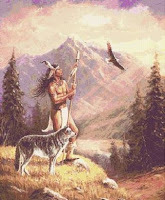 My heart sings Lakota (standing up, rising sun), the place where green grass grows. I feel the wind upon my face, the breath of life does blow. And inside my heart I know the storm is perfect raging flow. Nakota (embrace) you bring me peace among the stars. Dakota (wind) you sing to me, keeping all in the perfect know. And when I am united, in song and flesh we do never part. I say, my heart and joy does long to embrace all the perfect parts. I am the spirit of the four directions, the holy temple within me and I can fly beyond the clouds, to greet perfect company. I bless the nine directions, the north south east and west, the up and down and all around, bring evolution abound. Now inside and out stands side by side to bring us complete and content. It's peace I know among the hills, where the green grass grows every time, the paradise of the sublime. The promise, that G_ah_d (utterance of heavenly transmission) is here inside. A light from within begins. Welcome home Rainbow Warriors of Prophecy! through Space Grandmother, "Where are we going?" within and bridge between the worlds. As they dwell in the House of the Beloved (Star of David)1 as kinsmen upon Mother Earth's Plum Blossoms2, they become the Paladins to the Golden Age. overcome the opponent. The Sleeping Dragon3 within the Golden Palace dreams the glorious song of victory as the sweet fragrance fills the flight, flowing formless. Warrior knows the true master dwells within. Sanskrit name meaning "Gentle Glory"
*The “gate of no gate” speaks of the “gateway” between darkness and light, like how the sun touches the earth and how the light cleanses with the law of love, the red road. Here Holiness is born. The lavender person represents pure fire, that cleanses the earth, Our Holiness (many are crowned ones of earth). The “no gate” is known as the ”pearly gates or the doorway” like when the sky meets the heaven. Here Peace is born. The crystal person represents the crowned one of heaven, Our Peace. When Heaven and Earth merges together, the “gate of no gate” opens into the House of the Beloved1 (Star of David) the “horizon”a lies before us within as we enter the vision quest. When we learn truth from within, we become servants to this brotherhood of Oneness and a Great Caretaker is born. The Golden warrior takes his place, entering the vision quest and knows: Knock and the door shall be opened. Ask and you shall receive. Walk the path of the Golden Warrior through the “gate of no gate” where Holiness and Peace abide together upon Heaven and Earth. aThe “horizon” is the place where we enter the unknown numinous, the black hole, to seek our vision quest. Here where the Great Caretaker is born, the Golden Warrior, who has united the physical world with the soul world, has found vision into the unknown and fears no more. He has now become the Sage following the way, the true way, the one way, as the formless flows everlasting. During these times it is said that, “a body is born at sunset in the west ” (reflection) and “a soul is born at sunrise in the east”. (truth is west is the rising sun, and east is the setting sun) These are ominous times of majestic grace, that feeds our very beings with light at the horizon. The magenta person shows us time after time how to serve others as are they the keepers of the books of life. God's librarian to all information. The magenta person represents the Great caretaker as well as the horizon's luminosity like at sunrise and sunset, Our Grace. 1 The House of the Beloved (Star of David, crystalline perfection), which includes all our relations; rocks, plants and animals. We travel towards Oneness as a part of Evolution. The Great Father, Great Mother Spirits and the Ancient Ones consider us the beloved children of light and as One Multi-colored Rainbow Clan. We learn that we are perfect beings from within as we learn to receive love. We are divine from the numinous flowing as we tell our stories throughout time and space. and temples just as we celebrate in our heart. life of breath, as the flower unfolds. as the perfect diamond sutra. The aqua person lives their lives as leader of men, who create the impossible, a realization. 4 The numinous, or nameless, is the feeling filled with a sense of the presence of divinity or holiness. As well as appealing to the higher emotions of love and the aesthetic sense of our spiritual life. as the Mayan astronomers predicted. when the pipe comes in your heart and knows where Mother is then we will fly to the heavens and see where god begins, so reach in your heart and find the way, just reach in your heart and sing. speak all the ones who are elder and true, find their way find their heart that is blue,when we know the song of all the waters that are pure, and the song of all the breathers that flow. and when smoke that arises from mother bosoms heart, bless the sacred space that always knows the way, so heaven when we mistake each other, when we don't know our sacred way, let us help to receive our brothers and our sisters who are pure. let them know that each other is only if you both walk on inside your heart is where we sang upon the road, let us remember this heart we stand, let us remember this one we make our way. let us remember god 's mighty hand and the sacred way of the fire pure, of the sacred way of the blue that's pure of the tears that flow for our bounty knows the way. Prayer to Heaven and Earth, the Nine Sacred Directions each time a fire is lit, including the Pipe! To the East and the West. To the North and the South. To the Up and the Down. To the Sacred all around. To the heartbeat and breath, I gift all my sacredness. I receive my life for thee. Forever in the breeze!